Powered by industrial grade 1G MHz TI AM3715 processor and runs on a flexible Windows Embedded Handheld 6.5 platform, PA692 delivers the faster performance in highly mobile environments. The PA692 features a comprehensive wireless platform that includes integrated GPS, Bluetooth, WiFi and 3.75G connectivity. It is also able to withstand multiple 5-foot drops to concrete and IP65-sealed against water and dust. 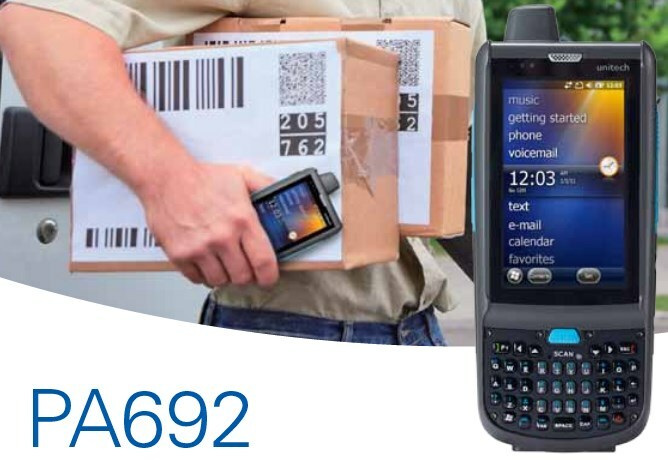 Perfect for fixed asset inventories, the PA692 was designed to meet the demands of today’s applications. Compact enough to fit in your shirt pocket, it is the lightest PDA in its class, weighing in at just 14 oz. The PA692 may be small in proportion, but is extremely powerful and durable. Once configured with Sage Fixed Assets – Tracking, bar code scanning is fast, efficient, and accurate. Small and lightweight, the 1D laser bar code scanner captures information accurately every time, and even scans most manufacturer’s barcode serial numbers! (1) Custom Configuration and testing, Fixed Asset Software Installation. We install, configure, and test Sage Fixed Assets. When you get the unit, it will be ready to use immediately, right out of the box!! Sales tax and shipping are billed additional. These are currently in stock, and would require approximately 1 week to configure, test, and ship (overnight at your option for additional cost).